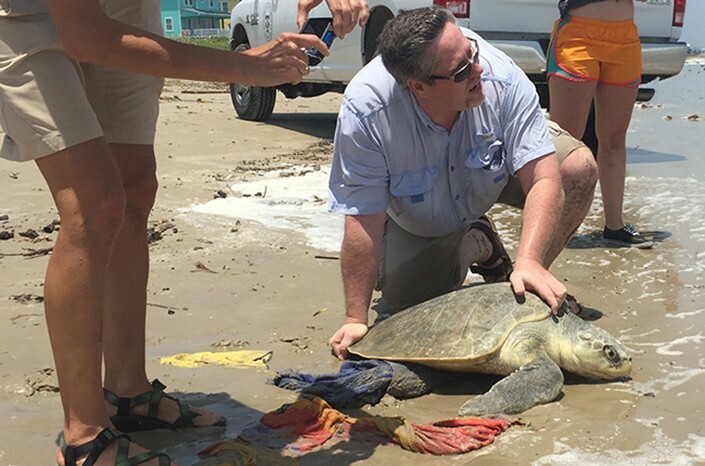 Efforts to save the endangered Kemp’s ridley sea turtle received a big boost from a two-year $220,162 funding commitment to a Texas A&M University at Galveston researcher. Christopher Marshall, associate professor of marine biology on the Galveston campus, received the funds as part of the Deepwater Horizon natural resource damage assessment settlement from the state and federal natural resource trustees, which include the Texas Parks Wildlife Department, the Texas Commission on Environmental Quality, the Texas General Land Office, the U.S. Department of the Interior and the National Oceanic and Atmospheric Administration. Kemp’s ridley turtles are the rarest of sea turtles. Their primary nesting grounds are in Tamaulipas, Mexico and along Padre Island on the Texas coast. In 1947, the number of nesting females in Tamaulipas was estimated to be almost 47,000 but that figure shrank to less than 300 by 1985. Their numbers had been recovering but has staggered in recent years, concerning both biologists and conservationists. Accordingly, Kemp’s ridley turtles are still on the critically endangered list of species issued by U.S. Fish and Wildlife and the International Union for Conservation of Nature, meaning there is a high risk of the species becoming extinct in the foreseeable future.